2018 has been an extremely busy year for us both, as we work towards the release of 'Paul Taggart's Elphen Chronicles'. Since completing a large portfolio of an additional 100 oil painting vignettes for that project I have been able to turn my attention back to one of my on-going Paul Taggart Collections of Masterworks, including one that Eileen and I had started to film as a Masterclass – literally just released, hot off the press as ‘[Series 3] Masterclass in Oils with Paul Taggart’. 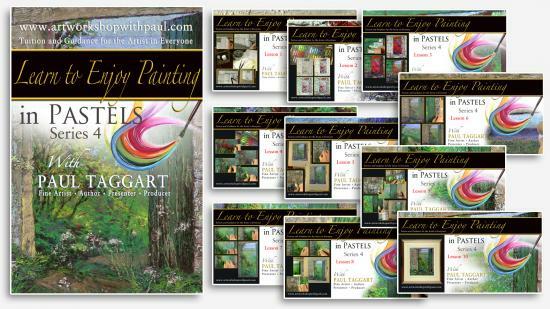 We have also been able to complete and release ‘[Series 4] Learn to Enjoy Painting in Pastels with Paul Taggart’ - whilst Eileen has been beavering away on making compilation FREE-TO-VIEW 'ArtBytes from Paul' Bonus Features (the first 21 of many more to come - – available through our ‘ArtBytes from Paul’ channel on the official ‘Paul Taggart’ Vimeo account). As we’ve written before, we’re not turning away from our online tutorials and we’ll be keeping in touch with news of developments as they happen – for Eileen and I have been discussing the future for our online video tutorials, because we very much enjoy sharing my passion for ‘the art of’ and ‘enjoyment in’ painting. NOTHING CAN COMPARE TO THE RICHNESS of WORKING WITH TRADITIONAL TECHNIQUES in OIL PAINTING; which is what I use for my principal body of artworks, as a professional Fine Artist. Those who are familiar with our ever-growing catalogue of on-line tutorials know that sharing this passion for these techniques is the driving force behind these box-sets; through which you can not only watch my step-by-step application of these techniques, as well as colour mixes, but also listen to my highly detailed running commentary. In ‘[Series 3] Masterclass in Oils with Paul Taggart’ you are invited to watch-along as I worked on a painting destined for one of my collections of Masterworks; a collection featuring some of the rivers and lochs in northern Scotland, beloved of those who fish these beautiful ‘gems’. You join me not only on the banks of the Findhorn river on the day, but perched on one of the rocks in the middle of the river, as I go about my very first, on-the-spot thumbnails. 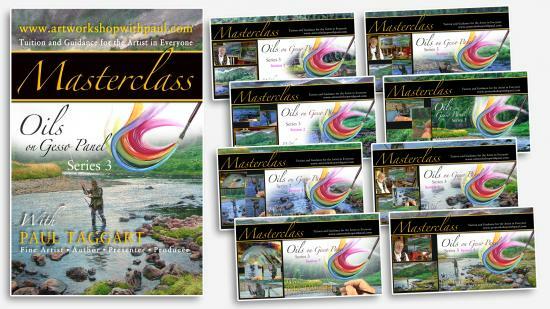 The focus and purpose of this Masterclass box-set is to share with you the method for rendering a ‘moving’ figure within a landscape; to share with you my thought-process and the traditional techniques/method that are the basis of my Masterworks oil paintings. Just as we do with all of my online video tutorials, nothing is withheld as you get to watch from start-to-finish, each layer of the process of rendering the figure, working from dark-to-light – accompanied by my running commentary and footage of my colour mixing on the palette. Close-up footage captures those all-important layers; from the thin underpainting through the impasto layer and the rich quality of glazes, not to mention the subtle, yet powerful effects of tints, to the final super-highlights. Throughout the eight videos, we also feature a reprise of the overall work as I complete each layer; in order that you can follow the development of the surrounding landscape as you watch the figure being brought to life through my colour mixes and brush-strokes. We look forward to your company and as always, this comes with best wishes for your painting from Eileen and myself.